Ecological and genetic processes producing speciation: the interplay between hybridization, poliploidy, and local adaptation in generalist plants. A scientific project funded by the Ministerio de Economía y Competitividad. The analysis of the processes that generate and maintain species as evolutionarily independent entities is one of the hot research topics in evolutionary biology. In spite of the progress that has taken place over the last decade, the challenge of integrating the different speciation processes remains. It is necessary to analyze how adaptation to local factors, whether abiotic or biotic, interacts with the genetic processes that cause reproductive isolation, particularly under ongoing gene-flow. In the case of the angiosperms, pollinator specialization has been found to be one of the most significant factors for evolutionary diversification. However, the role of pollinators remains unclear in the case of systems with generalist pollination syndromes. The populations of a generalist species can shift their pollination niche by altering the visit frequency of the different pollinators. It is unknown whether these shifts are mediated by independent modification of the same genes or if they are the result of adaptation by introgression. Additionally, other genomic processes can generate new species and contribute to their evolutionary independence. Hybridization and polyploidization are arguably the most relevant of these processes in plants, and are considered to be largely responsible of the angiosperm diversity. Our starting hypothesis is that phenotypic changes associated with the interaction with pollinators can be involved in speciation even in species with a generalist pollination syndrome. 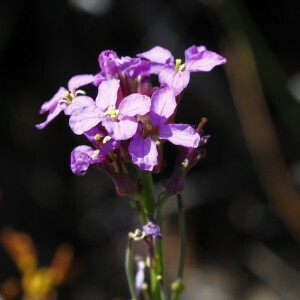 A shift from yellow (typical in genus Erysimum) to purple petals might entail a shift in the relative abundance of the different types of pollinators, and might increase the visit rate of bees, which are highly efficient pollinators. However, these changes do not suffice to ensure reproductive isolation. Hence, other factors such as local adaptation, especially in the earliest ontogenetic stages might have played a relevant role in the radiation and diversification of the genus. Lastly, hybridization and polyploidy would foster and accentuate the differentiation process, inducing speciation. The working hypothesis is that the high rates of speciation of Erysimum are the joint result of all these processes. To validate these hypotheses, we plan to characterize pollinator preferences and local adaptation with a focus on the early developmental stages between species of this genus that differ in their flower color. 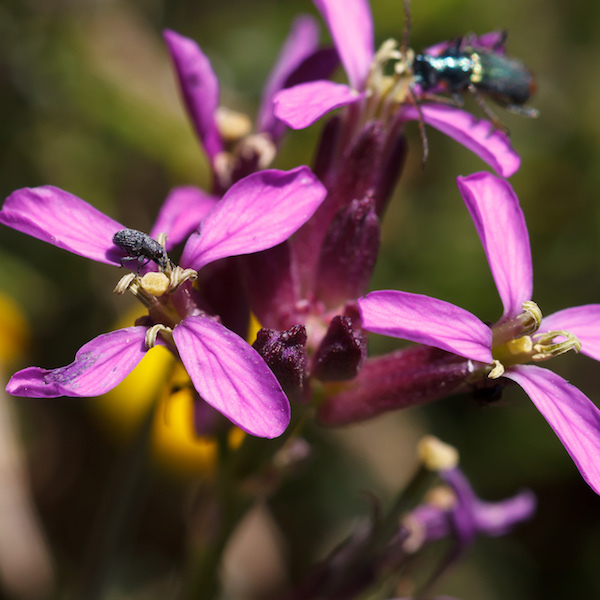 We also propose to characterize prezigotic postpollination isolation and ploidy variation in sympatric populations of Erysimum mediohispanicum, E. bastentanum and E. popovii. Lastly, we will use next-gen sequencing techniques to determine the role of hybridization in the history of the studied species. This will enable us to estimate evolutionary divergence among them and to test the hypothesis that flower color has evolved by adaptive introgression.